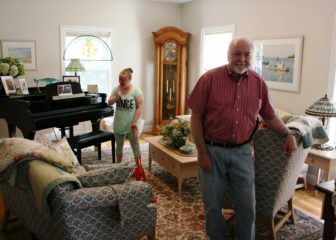 Salem — Three years ago, Tom and Arlene Reith moved into a slate-gray, four-bedroom colonial on a quiet street in rural Salem with their 22-year-old daughter Sarah, who has Down Syndrome and autism. They’d come from Long Island, where he was an executive at an engineering firm and she had worked as credit manager for Barron’s Publishing. The relocation was planned with Sarah’s needs in mind. Three of their sons and a daughter-in-law live nearby and work at General Dynamics Electric Boat in Groton, Arlene explained. The couple wanted to live closer in their retirement years for everyone’s sake. Tom Reith and his wife moved from Long Island to Salem after retirement to be near family and take advantage of state-funded services available to their developmentally disabled daughter. “We felt that this is where Sarah would have a circle of support,” she said. Opportunities for their special-needs daughter, then 18, seemed excellent. 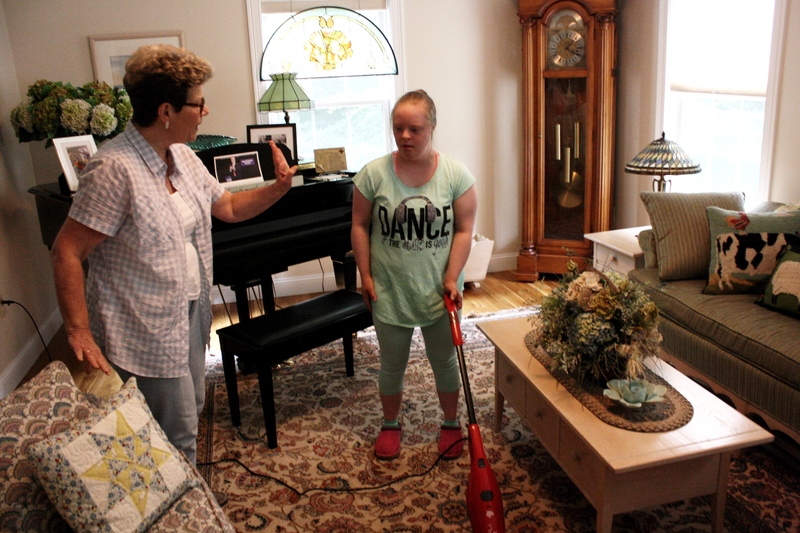 She enrolled in East Lyme High School, which routinely accepts students from nearby Salem and offers robust services for those with autism. Last year the school was one of four Connecticut public schools named as National Blue Ribbon Schools by the U.S. Department of Education. Then, in June 2017, spending cuts ordered by the state to cope with its budget crisis resulted in the closure of many day programs for developmentally disabled clients. Right after graduation, all that summer and into the fall, Sarah’s Monday-through-Friday visits to ARC of New London were curtailed. Contact with her familiar peer group was lost, along with the stable schedule that allows Sarah to feel happy and secure. Sarah’s world shrank to her home and her parents. When they tried enrolling her in another “day camp,” she sulked and refused to participate. The Reiths were grateful when the ARC’s day program was restored in early December after six months. Tom Reith said ARC of New London provides an outstanding level of service. Sarah and others in the day program travel to local parks, go bowling, or visit Mystic Aquarium, much more energetic field trips than the family experienced during their time in New York. On a recent summer afternoon, Sarah came home happy and energized, wearing a pink blouse with “Mermaid in Training” on the front. At 4-foot-8, she is girlish in stature and doesn’t verbalize, instead using a flickering gesture of her hands at her cheeks to show that she’s pleased or excited. Sarah likes to keep active, helping in the kitchen and running a vacuum cleaner on the living room rug every afternoon. The next step, her mother said, will be finding a group home placement. Like so many others, however, Sarah is on a waiting list.